The 35-day partial shutdown of the federal government that ended Jan. 25 was a misnomer. Fractional would be a more accurate term, at least in New Hampshire, because what was actually shut down was just the toe of the elephant of the federal government in the Granite State. But try telling that to the 2,400 federal workers who missed two paychecks (about 1,600 of whom worked without pay). Or the borrowers and contractors waiting for tens of millions in loans and contracts. And try telling that to Mark Thurston, president of Hampton-based CUSA Consulting, who kept paying his 32 idle employees who work on electrical systems in airports around the country, even though the Federal Aviation Administration wasn’t paying him. Next time — and there is a good chance that next time could start in a few weeks — it could be more painful, especially if it spreads to the rest of the government. While NH only ranked 50th in terms of the shutdown’s impact, it ranked 15th in regard to federal contracts per capita. New Hampshire ranked 50th among all states and the District of Columbia in terms of the shutdown’s impact, according to one survey by WalletHub. That was mainly due to the relative small number of federal workers and food stamp recipients in New Hampshire. But that same study actually ranked the Granite State 15th in terms of federal contracts per capita — although when it comes to contracts, New Hampshire is more dependent on defense spending than most states. And the DoD remained open during the shutdown. The federal government spends $10.3 billion a year in New Hampshire, or $7,600 per person, according to a federal website maintained by the U.S. Office of General Contracting. That’s about an eighth of the state’s gross domestic product. More than half of that total, or $5.7 billion, is made up of direct payments to individuals. Think Social Security checks, which kept on coming because that agency stayed open. 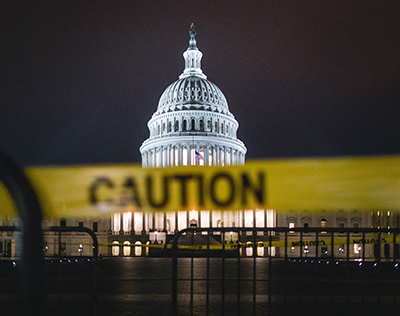 The shutdown involved some 2,400 workers out of nearly 8,000 in the state, because agencies that employ the most federal workers, like the post office and the Veterans Administration, remained open. The federal government also gives out $2.3 billion in various grants a year, and those grants account for 37 percent of state spending — the 11th highest percentage in the nation — but they also go to universities, hospitals and nonprofit agencies. And the federal departments of Health and Human Services and Education both continued to operate during the shutdown. Then there were $2 billion worth of federal contracts awarded last year to New Hampshire contractors, with $100 million of that given out by agencies that would later be affected by the shutdown. The largest portion of the contracts, $1.5 billion, came through the DoD. Indeed, the top five big spenders in the state — Social Security, Defense, HHS, Veteran Affairs and Education — representing 90 percent of federal spending, were unaffected by the shutdown. In other words, during this government shutdown, almost all of the government was open for business in New Hampshire. And it would take some time for the state to feel the full effects of those that were closed — Transportation, Treasury (the Internal Revenue Service), Interior, Agriculture (food stamps), Homeland Security (TSA, customs and the Coast Guard), Commerce (export services), Housing and Urban Development, Justice (FBI and the federal courts) and State. Some of those agencies still had money in the till during the shutdown. The USDA, for instance, would have been able to make food stamp payments through February, not only sparing some 92,000 recipients but all of the grocery stores where they shop. HUD was able to pay the subsidized rent of some 10,000 families, a huge relief not only for them but all the landlords who participate in the Section 8 program. The highway fund was able to pay federal road contractors, at least initially, said Gary Abbott, executive vice president of Associated General Contractors of New Hampshire. “If we get into three months of shutdown, that would be another story,” he said. Stock had also worried about a backlog of work visas (since both the State Department and Homeland Security were affected by the shutdown) and how that would hurt employers’ ability to hire seasonal help for sawmill work. “And that could affect any business who uses seasonal workers,” he noted. Trade consultant Dawn Wivell, CEO of Firebrand International LLC, hadn’t seen much of an impact on the trade shortly before the shutdown ended. “But some of my clients are concerned about getting their export licenses if this goes on. Without that, they would not be able to conclude a sale,” she said. Other contractors had other government work to fall back on. “We are mainly a defense contractor,” said Bob McArthur, general manager of the Cobham Advanced Electronic Solutions facility in Exeter, which last year had about $3.1 million in contracts with the shutdown agencies, mostly FAA-related. But even that is “a small percentage” of the facility’s business — “under 10 percent,” he said. Lyme Computer System in Lebanon had about $3.5 million in contracts with agencies by the shutdown, ranging from the FBI to the National Oceanic and Atmospheric Administration under the Department of Commerce. The situation might be similar at Red River Computer Co. in Claremont, though we won’t know for sure. The firm didn’t respond to inquiries as did a number of the state’s top government contractors — wary, said one consultant, of giving any appearance of criticizing the government that they so depend on for business. Red River had more contracts than any company in the state with the affected agencies — $25 million in 2018. But it had a total of $219.4 million in federal contracts, putting it just behind defense contractor BAE Systems as the largest federal contractor in the state. CUSA Consulting, however, didn’t have much of a backup. Nearly all of its work is FAA-related. The company was hammered three ways. It didn’t get any new contracts during the shutdown. It didn’t get invoices on completed contracts. And it couldn’t work on current contracts because they require an FAA inspection. The company had just finished up a Manchester job before the shutdown, but in Miami, “a lot of my equipment is just sitting there,” said CUSA President Thurston, a month into the shutdown. He paid his workers because he couldn’t afford to lose them, keeping them busy cleaning trucks, playing hockey and working for Habitat for Humanity. “I’m going the distance,” he said during the shutdown. That distance will be longer than the actual shutdown, since he expected there will be a backlog that would mean long delays in contracts, payments and inspections. Wages and federal contracts are easy to add up. The average federal worker missed at least $10,000 in pay over the five weeks, so that translates into about $25 million a month. Then there’s at least another $20 million in Small Business Administration loans and contracts lost. Include federal grants, Section 8 rental assistance and food stamps, and you come up with somewhere between $50 million and $80 million in federal dollars lost in New Hampshire. But then there’s the other economic costs that many of these dollars leverage. “We just lost a deal,” said Stephen Heavener, executive director at the Concord-based Capital Regional Development Council. “It was a restaurant in Hooksett that needed a $150,000 SBA 504 loan guarantee to close around Christmas.” The deal was worth nearly twice that amount, he said, but because of the delay, the restaurant wasn’t able to open in time to take advantage of the season. “So he called it off,” said Heavener. And then there are “all these deals that might have been,” he said, because few applied to the SBA when its office was closed. “It may be more than those that are not being authorized, but we have no way of knowing that,” he said. The federal shutdown also affected the housing market. Nationally, a Realtor association survey found that 25 percent of those responding felt it had an impact on future clients, not just because of a holdup on mortgages needing certain federal approval but because of the overall contribution to general economic uncertainty. Commercial real estate could have been affected too. Chris Norwood of NAI Norwood Group in Bedford said he lost a buyer for a multifamily unit in Manchester due to a HUD loan being held up. The seller went with someone else with conventional financing, so there was no economic loss to the state, but hold-ups further down the line, including an anticipated backlog after the partial shutdown ended, could sabotage some deals. “The longer the wait for the loan is, the higher the chance for any potential purchases of buildings or land to fall apart,” he said. The NH Housing Financing Authority had six projects that were being held up in one way or another, said Grace Lessner, an authority spokesperson. St. Regis House in Berlin, for instance, is a historical building being rehabbed for affordable housing but needs National Park Service approval. “But progress continues and we don’t anticipate that the projects will be hindered unless the shutdown goes on for many months,” Lessner said. There was also concern that the shutdown could have affected agencies where the government remained open. “Things are so intertwined,” said Pease. Business groups, which watched the shutdown during the first weeks with increasing dismay, finally started speaking out toward the end. And this, after a small fraction of the federal government was gone for a little over a month. Imagine what a total shutdown would be have been like. In the end, businesses sometimes feel like they can’t live with the federal government. But in reality, they couldn’t live that long without it.